The last decade has seen an explosive burst of new information about human origins and our evolutionary status with respect to other species. We have long been considered unique as upright, bipedal creatures endowed with language, the ability to use tools, to think and introspect. We now know that other creatures may be more or less capable of similar behaviour, and that these human capacities in many cases have long evolutionary trajectories. Our information about such matters comes from a diverse variety of disciplines, including experimental and neuropsychology, primatology, ethology, archaeology, palaeontology, comparative linguistics and molecular biology. It is the interdisciplinary nature of the newly-emerging information which bears upon one of the profoundest scientific human questions - our origin and place in the animal kingdom, whether unique or otherwise - which makes the general topic so fascinating to layperson, student, and expert alike. 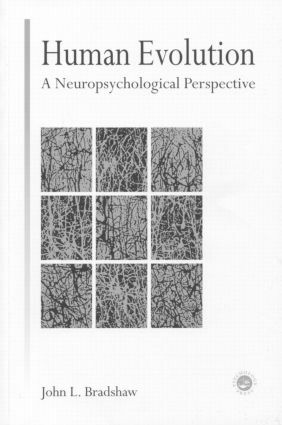 The book attempts to integrate across a wide range of disciplines an evolutionary view of human psychology, with particular reference to language, praxis and aesthetics. A chapter on evolution, from the appearance of life to the earliest mammals, is followed by one which examines the appearance of primates, hominids and the advent of bipedalism. There follows a more detailed account of the various species of Homo, the morphology and origin of modern H. sapiens sapiens as seen from the archaeological/palaeontological and molecular-biological perspectives. The origins of art and an aesthetic sense in the Acheulian and Mousterian through to the Upper Palaeolithic are seen in the context of the psychology of art. Two chapters on language address its nature and realization centrally and peripherally, the prehistory and neuropsychology of speech, and evidence for speech and/or language in our hominid ancestors. A chapter on tool use and praxis examines such behaviour in other species, primate and non-primate, the neurology of praxis and its possible relation to language. Encephalization and the growth of the brain, phylogenetically and ontogenetically, and its relationship to intellectual capacity leads on finally to a consideration of intelligence, social intelligence, consciousness and self awareness. A final chapter reviews the issues covered. The book, of around 70.000 words of text, includes over 500 references over half of which date from 1994 or later. Preface. Preamble. I Evolution to the Advent of the Mammals. Formation of Universe and Earth. Appearance of Life. The Cambrian Explosion of Diverse Life Forms. The First Chordates and Vertebrates. The First Tetrapods. The Earliest Mammals. Summary and Conclusions. II Primates to Hominids and the Advent of Bipedalism. The Primates. The Anthropoids. The Hominid Lineage. The Advent of Bipedalism. Obstetrics and the Pelvis. Summary and Conclusions. III Evolution of the Genus Homo. Homo Habilis. Homo Erectus. Archaic Homo sapiens and the Neanderthals. The Morphology and Origin of Anatomically Modern H. sapiens sapiens. Evidence from Molecular Biology. Migration and Expansion. Summary and Conclusion. IV Art and Prehistory. Art and Culture of the Mousterian and Acheulian. The Art of the European Upper Palaeolithic. The Psychology of Art, Ancient and Recent. Summary and Conclusions. V Language and Communication. The Coevolution of Genotype and Language. The Prehistory of Spoken Language. Language, Speech and Communication. (How) did Language Evolve? Critical Periods and Speech Perception. Categorical Perception. Categorization in Nonhuman Communication. Language Meditation by a Distributed Network. Apes and Language. A View of Language Evolution. Gesture and Language. Summary and Conclusions. VI The Central and Peripheral Realization of Speech. Speech and Articulation. The Supralaryngeal Vocal Tract in Apes and Humans. The Supralaryngeal Tract in Apes and Neanderthals. Did Homo habilis Possess Speech-related Areas in the Brain? Speech-related Areas and Aphasia in Homo sapiens sapiens. Category Specificity and Semantic Representation. Neuroimaging and Speech Localization. Summary and Conclusions. VII Tool use and Praxis. Nonhuman Tool Use. Hominid Tool Use. Movement, The Frontal-Basal Ganglia Circuits and Praxis. Apraxia: The Loss of the Ability to Use Tools. Praxis, Tool Use and Language Evolution: Is a Synthesis Possible? Summary and Conclusions. VIII Encephalization and the Growth of the Brain. The Allometric Ratio. The Growth of Encephalization in the Fossil Record. Laminar and Columnar Organization in the Cortex. Neurogenesis and Brain-Body Growth and Development. Plastic Reorganization in the Adult Brain. Whole Object Recognition and "Binding". Brain Size and Intellectual Capacity. Summary and Conclusions. IX Intelligence, Social Intelligence, Consciousness and Self Awareness. The Evolution of Intelligence. The Theory of Machiavellian Intelligence. Self-Recognition in Mirrors and Self-Awareness. Consciousness. Summary and Conclusions. X An Overview. Postscript. References.